There are few figures as iconic of the medieval ages as the knight on horseback. Historically, this figure could be quite varied, and this Gothic Knight on Horseback Statue depicts one such version in his iconic armor as he rides off into battle. This particular knight reflects the typical look of knight from Germany. 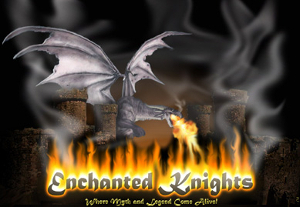 His gothic plate armor shows off ornate ridges in its form and the knight carries a sheathed sword at his side. His horse, too, is arrayed in heavy barding to match its rider. The statue itself is crafted from cold cast resin that is hand painted in steel grey tones and accented with touches of yellow-gold accenting. 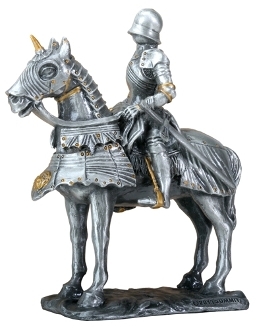 A perfect blending of history and fantasy, this Gothic Knight on Horseback Statue is a must-have for armor aficionados, history buffs, and knight enthusiasts of all ages.